Difference between revisions of "Breeding"
Breeding is the main way to obtain Dragons. Breeding is done by pairing two adult Dragons (Level 4 or higher) in the Breeding Den, the only place where Dragons can breed. The amount of time it will take to breed a Dragon is determined by the Elements and type of the two Dragons being bred together and the Dragon which will be produced from that breeding. Usually, the longer the time it takes to breed, the rarer the Dragon will be. 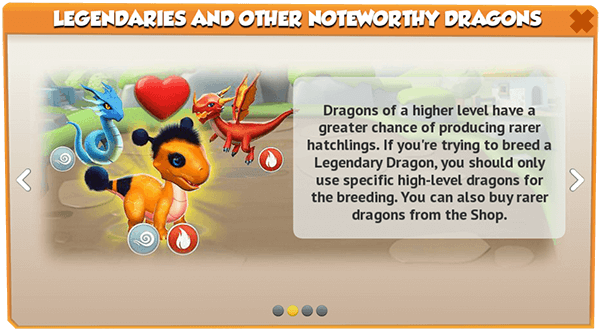 Dragons with more advanced Elements and a higher rarity will take more time to breed and incubate. Breeding times can vary from 30 seconds for a Fire Dragon to 4 days for a Divine Dragon and are affected by the VIP Status. Dragons must reach Level 4 before they can breed. Each parent will pass at least one of their Elements to their offspring (unless exceptions occur). The classification of a Dragon does not affect the breeding outcome. Breeding lower-level Dragons typically produces lower-rarity offspring. Breeding higher-level Dragons typically produces higher-rarity offspring. Dragons that can be be bred at all times will always be found in the Main Shop. Some Dragons are not normally obtained through standard breeding. They may be awarded through events or a variety of other methods, or be offered for limited-time breeding, as in the case of the Dragon of the Week and the Dragon of the Month. Additionally, Chronos, Boss Dragons and Clan Dragons can not be obtained through breeding. After accessing the limited-time breeding screen, the Trainer will be given recommendations on which Dragons to breed next, in addition to the Dragon of the Week and Dragon of the Month. One Dragon is randomly chosen from the Normally-Breedable Dragons the Trainer does not have on their islands, with the notable exception of Breedable Legendaries, while the other Dragons are chosen from those that are available for breeding through a Breeding Token. The Trainer will also be given the option and using it will bring up the combination of Elements that are recommended to use in order to breed the Dragon. When breeding two Dragons, there is usually no guarantee of what Dragon will be obtained. The exception is when there is only one possible outcome for the resultant Dragon, such as when using two single-Element Dragons that are of the same Element. An example of this would be to breed Fire Dragon + Fire Dragon, which can only result in the breeding of a Fire Dragon. Baby Dragons will usually inherit one or more Elements from each parent with the exception of Legendary and Divine Dragons. Additionally, the Trainer can not obtain, through breeding, Dragons with Elements that are higher than the Trainer's level. For example, if the Trainer manages to obtain an Agent Dragon from the Dragon League and they are under Level 15 (when the Metal Element is unlocked), they will be able to hatch the Agent Dragon and even breed it with other Dragons, but the Agent Dragon will never pass the Metal Element (or the Void Element until Level 25) until the Trainer reaches Level 15, and will only be able to pass the Earth Element. 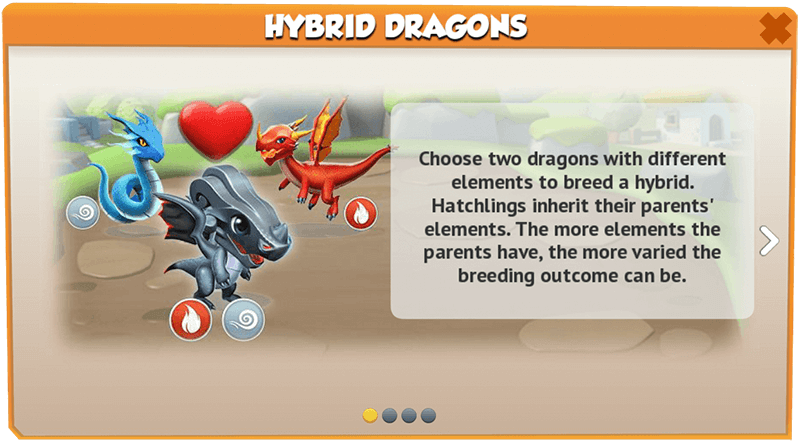 Breeding the same pair of Dragons multiple times can lead to various results since the specific Dragon that will hatch is randomly chosen based on the available Elements of the breeders. 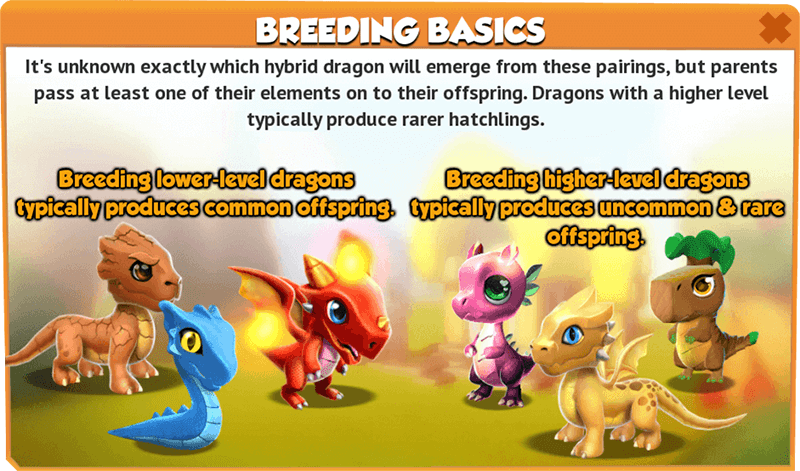 Breeding two Dragons of higher rarity and levels will increase the chances of producing a Dragon of higher rarity. Breeding outcomes for a specific Dragon or Dragon of higher rarity may require many breeding attempts. The only exception is for Guaranteed-Breedable Dragons. These are the only Dragons that can result from certain Elemental pairs. The Breeding Calculator is a helpful tool for determining what the outcome of a specific breeding may produce. Legendary and Divine Dragons act as wild cards for breeding, but they pass only one Element from the ones which the user has unlocked by leveling up. Only Base Dragons and Bi-Elemental Dragons (with the exception of the Sunflower, Mercury, Lightning, Magnet and Emperor Dragons) can be obtained by breeding two Legendary or Divine Dragons, regardless of whether either parent has any of its secondary Elements unlocked. The Element passed by one of the parents can be any Element in the game, regardless if the parent possesses it or not (awoken or unawoken), as long as the Trainer themselves have unlocked it through their level. Additionally, Legendary and Divine Dragons also do not follow the breeding principles when it comes to being bred, as Legendary Dragons can either be obtained through specific combinations or through a limited-time breeding event while some Divine Dragons are only extremely rarely made breedable. When Legendary or Divine Dragons are used as part of the combination for a Dragon of the Week, they do not have to have their secondary Elements awoken in order to have a chance at breeding the respective Dragon. Breeding VIP Dragons is done the same way as breeding Normally-Breedable Dragons, the difference being that the Trainer needs to be a certain VIP level before these Dragons can be bred or even purchased. Additionally, they can only be bred while the VIP Status is active, regardless if the Trainer has the necessary VIP level. Additionally, the above five Dragons are the only ones part of the specific combinations for obtaining Breedable Legendaries. The breeding of Enchantment Dragons can only be done following a specific criteria. Specific Dragons will need to be enchanted to certain levels and paired in predetermined combinations to obtain the Enchantment Dragons. 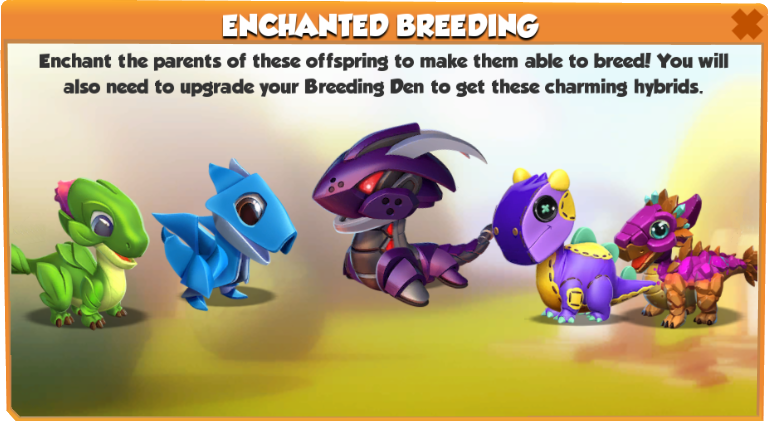 In addition to requiring a unique combination with different Enchantment levels, the Breeding Den will have to be upgraded to certain levels in accordance with the requirements of the desired Dragon. 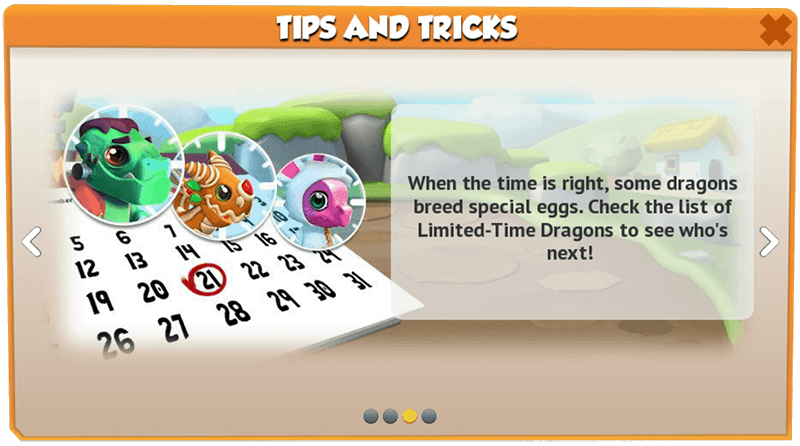 Limited-Time Breeding, while not an event in the true sense of the word, is a so-called breeding event whose sole purpose is to successfully breed a Limited-Time Dragon in the allotted time with the Dragon being the event reward. There are three types of such events. Breeding Tokens are special items that are activated instantly upon obtaining. They offer the Trainer the opportunity to breed a Limited-Time Dragon for either an indefinite or temporary period of time. These Dragons follow the same breeding principles as Normally-Breedable Dragons. 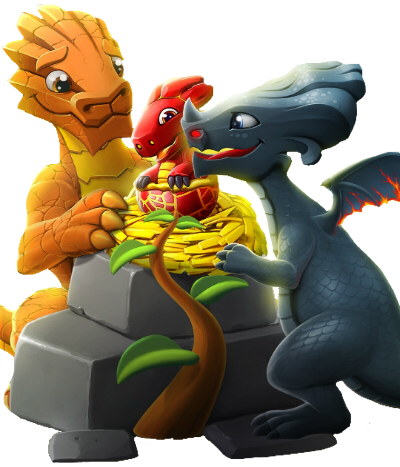 Five Breeding Tokens are obtained from the Dragon Collector Leaderboard while others are obtained through events. Once a token is obtained, a confirmation screen will appear giving the Trainer the option to close it through the button or to immediately proceed to breeding the Dragon through the button. If a token is obtained for a Dragon which had already been activated through another token, the period of time, during which the Dragon is available for breeding, will simply be extended. Breeding Dragons is one of the methods for earning points in Castle Events and Arcade Events. During The Great Dragon Race and Clan Siege, a type of Clan Events, completing various Clan Quests, among which breeding Dragons is one of the objectives, will give the Trainer items necessary for competing in those events. Chain Breeding Events are events which offer the opportunity to breed for some specific Dragons in a pre-determined order. For the duration of one week, a limited Bi-Elemental or Tri-Elemental Dragon, classified as Rare or higher, is made available for breeding through the use of two specific Dragons. In extremely rare cases, a Legendary or a Divine Dragon can be made available as a Dragon of the Week. For the duration of one month, a limited Legendary Dragon is made available for breeding through the use of any Dragons having together four specific Elements. For the duration of a very short period of time, usually only a few days, a Dragon is made available for breeding through the use of any Dragons having together a given number of specific Elements. Currently, the only Dragon to have been flash-breedable at some point is the Lantern Dragon. Once two Dragons are sent to the Breeding Den, they will breed for a period of time to produce one egg. Eggs need to be incubated in the Hatchery until they are ready to hatch. Once the incubation period is complete, the baby can hatch from its shell and be placed into one of the Habitats or sold on the spot. The amount of time it takes for a Dragon to be successfully bred is determined by its Elements and rarity while an active VIP Status of Level 2 or higher reduces the amount of time by 20%. The Boiling Dragon is classified as Common and possesses the Fire & Water Elements. Thus, without VIP, the breeding time is 4 hours while with VIP, the breeding time is 3 hours and 12 minutes. The Storm Dragon is classified as Epic and possesses the Wind, Energy & Void Elements. Thus, without VIP, the breeding time is 22 hours while with VIP, the breeding time is 17 hours and 36 minutes. The following Dragons do not follow this formula and thus have their own breeding time. Aside from an active Level 2 VIP Status, which reduces the breeding and hatching time by 20%, any ongoing breeding time is also reduced by 60 minutes whenever the Trainer activates Amoura's ability and by 6 hours whenever Chronosian Seals are forged or Chronos' power is used. The entire breeding time can also be sped up in exchange for Gems. Additionally, the Trainer might be offered videos to watch in order to reduce the ongoing breeding time whenever the icon appears above the Breeding Den. The option reduces the time by 30 minutes every time it is used and can only be used twice in 24 hours. Update 4.0 introduced Breeding Tokens. The Breed Button was enlarged and the image of the Level 6 Breeding Den was replaced with that of the Level 2 Breeding Den. Update 3.7 has once again reintroduced watching videos in exchange for a time reduction, but with slightly different visual graphics. Update 3.6 has once again discontinued watching videos in exchange for a time reduction. Update 3.5 reintroduced the option to reduce the breeding time by watching videos. Update 3.1 discontinued the option to reduce the breeding time by watching videos. Update 3.0 introduced the Regular Breeding Helper as well as the option to reduce the breeding time by watching videos. Update 2.8 replaced the image inside the Breed Button with that of the Level 6 Breeding Den. 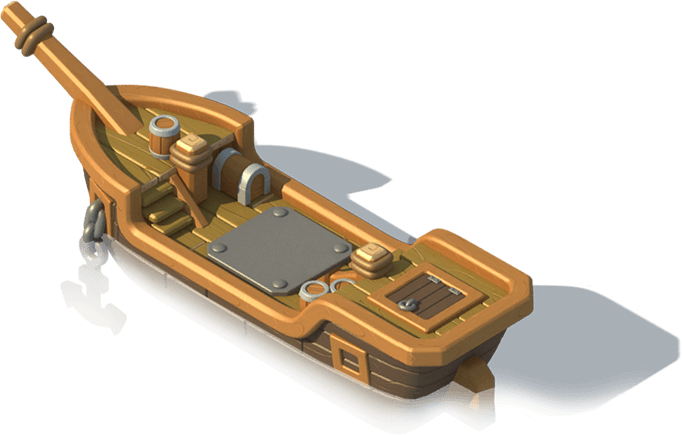 Update 2.6 introduced Amoura, a Clan Dragon that occasionally reduces the breeding time. Update 2.3 introduced Enchanted Breeding as part of the Enchantment feature.